“Sell By” date: Tells the store how long to display the product for sale. You should buy the product before the date expires. “Best If Used By” (or Before) date: Recommended for best flavor or quality. It is not a purchase or safety date. “Use-By” date: The last date recommended for the use of the product while at peak quality. The date has been determined by the manufacturer of the product. Closed or Coded dates: Packing numbers for use by the manufacturer. If a product is not “dated,” consume perishable ready-to-eat food soon after purchasing it, and no more than 3 to 5 days after opening it. Organizing your Refrigerator to be Food Safe! Always refrigerate perishable food within 2 hours (1 hour when the temperature is above 90 °F). Your refrigerator should be kept at 40°F or cooler. Raw Meat, Poultry, and Seafood should be placed in containers or sealed plastic bags to prevent their juices from dripping onto other food in the refrigerator. This could cause cross contamination. Cross-contamination is the transfer of harmful bacteria to a food from other foods, cutting boards, utensils, surfaces, or hands. It is prevented by keeping food separated and by keeping hands, utensils, and food handling surfaces clean. If you’re not planning to use the food within a day or two, freeze it. Eggs should be stored in the original carton and placed on a shelf in the refrigerator — not in the door. Produce (fruits and vegetables) should be stored in the refrigerator. 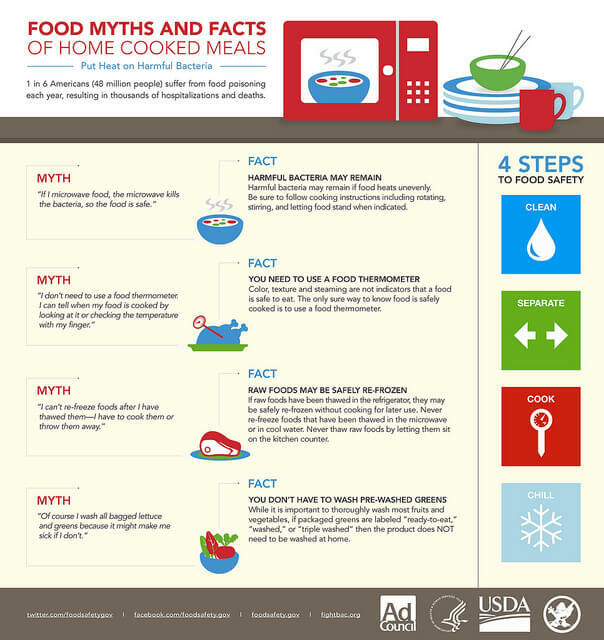 If any fruit or vegetable has touched raw meat, poultry, or seafood and will not be cooked immediately, do not eat it. Throw it away. Refrigerate (or freeze) leftovers within 2 hours in clean, shallow, covered containers to prevent harmful bacteria from multiplying. Wrap freezer items in heavy freezer paper, plastic wrap, freezer bags, or foil. Date all freezer packages. Use the oldest food first. — Place new items toward the back of the freezer — that way, older items are easier to access and you’ll use them first. If food is thawed in the refrigerator, it is safe to refreeze it without cooking. However, there may be a loss of quality due to the moisture lost through defrosting. After cooking raw food that was previously frozen, it is safe to freeze the cooked food. In addition, if previously cooked food was frozen and then thawed in the refrigerator, you may refreeze the unused portion. To maintain quality when freezing meat and poultry in its original packaging, overwrap the package with foil or plastic wrap that is recommended for use in the freezer. There are two easy ways to thaw — and because bacteria can multiply rapidly at room temperature, none of these methods involve the kitchen counter. In the refrigerator is the safest way to thaw meat and poultry. Take the food out of the freezer and thaw it in the fridge. Place it on a plate or in a pan to catch any juices that may leak. Normally, it will be ready to use the next day. For faster thawing, put the frozen package in a watertight plastic bag and submerge it in cold water; change the water every 30 minutes. The cold water slows bacteria that might be growing in the thawed portions of the meat while the inner areas are still thawing. Once thawed, cook it immediately. Always wash hands with soap and warm water for 20 seconds before beginning food preparation, after handling food, and after using the bathroom, changing diapers, or touching pets. Be sure to wash all fresh fruits and vegetables thoroughly under cold running water before use. Do not sneeze or cough into food. Harmful bacteria can spread throughout the kitchen and get onto cutting boards, utensils, and countertops — causing “cross-contamination.” Keep raw meat, poultry, fish, and their juices away from other food — especially raw foods or foods that do not need to be heated. Wash cutting boards, dishes, and countertops with hot, soapy water after preparing each food item and before you go on to the next item. After cutting raw meat, poultry, and seafood, wash cutting boards, knives, and countertops with hot, soapy water. Always use a clean cutting board for food preparation. Try to use one cutting board for fresh produce — and a separate one for raw meat, poultry, and seafood. Sanitize cutting boards with a freshly made solution of 1 teaspoon of unscented, liquid chlorine bleach in 1 quart of water. Once cutting boards become excessively worn or develop hard to-clean grooves, replace them.